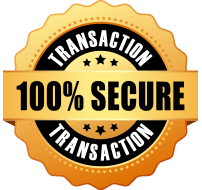 Why take unnecessary security risks when it is so easy to make your space a safe one? Our VIGIPIRATE compliant range of recycling bins will not only keep your facility impeccably neat but it will also ensure safe transit. The transparent waste streams will disclose any suspicious waste that is deposited inside, thus enhancing security. 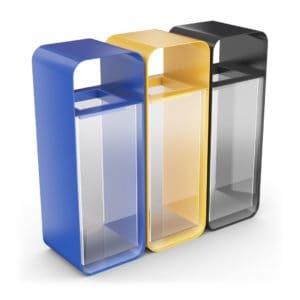 Security trash cans for Recycling As a leader in the recycling bin industry, Urbaniere offers you a wide choice of security containers adapted to recycling. 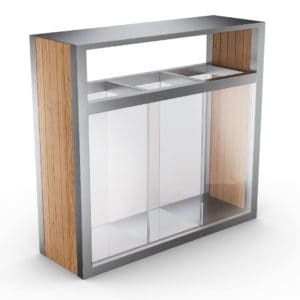 Urbaniere is particularly committed to waste optimization, environmental protection and public safety, and designs and manufactures designer bins to suit all budgets. 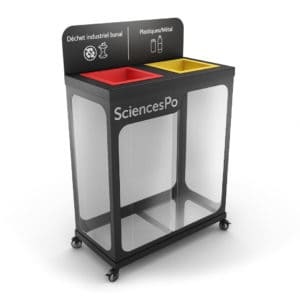 Dedicated to different public spaces such as universities, parks, airports or subways, discover here a unique selection of safety bins adapted to recycling. Why buy security trash cans for recycling? As in France, where it is known as the “Vigipirate Plan,” many countries are now on alert following the various terrorist acts committed around the world. Reinforced controls, increased vigilance and protection strategies, surveillance missions, and so on, tools to combat terrorism have been introduced in all areas, particularly in the field of the treatment of waste. Among the various suggestions, the installation of suitable bins is one of the recommended measures in certain high-risk areas. The security container allows you to quickly view the contents of the bin bag and check that no suspicious objects have been placed in it. In practice, a security bin must make it possible to see the contents at a glance and is therefore transparent. Visibility and easy control are the watchwords of our safety bins. All of them have a design aimed at offering greater security to all citizens. How? By providing transparent bins that reveal their contents. The use of translucent plexiglass makes it possible to provide this visibility, but also to have remote control of the waste containers. Maintenance and garbage collection teams can then, thanks to our systems, change garbage bags in complete safety. Law enforcement agencies can continue to provide more effective remote surveillance. 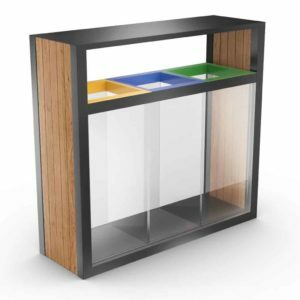 Our Boras security trash can for recycling, for example, is part of our range of transparent containers and is fully adapted to the new security measures. 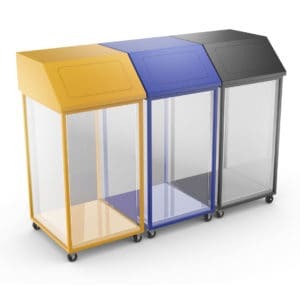 Take advantage of our extensive selection of colored security trash cans suitable for recycling. With a yellow container for plastic waste, a blue container for paper waste or a black container for organic waste such as food leftovers, our containers will simplify recycling and ensure the safety of all citizens. 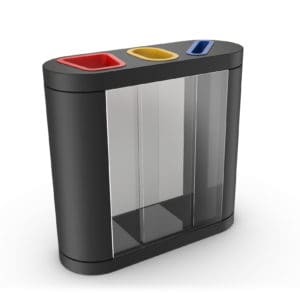 Thanks to our security trash cans and their various colored bins, you can quickly and efficiently optimize the disposal of waste, while ensuring that the contents of the trash cans remain visible. Our security trash can suitable for recycling, Copenhagen, is an excellent example of what we offer concerning recycling containers with transparent and colored bins. Thanks to its colored borders (blue, yellow, red…), each waste has its own place and can be analyzed from the outside. All this for safe and efficient waste management. To make selective sorting even easier, recycling trash cans with symbols are a perfect alternative. Paper, plastic, glass, for example. With small logos symbolizing the different types of rubbish, they allow efficient distribution of the waste. 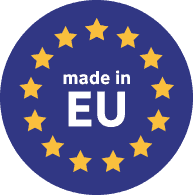 The Auriga model thus has informative messages and symbols for easy use. Its transparent containers allow effective waste control, while at the same time complying with safety standards. This makes this bin ideal for airports, stations, and other public places. Our safety bins for the outdoors have the necessary characteristics to brave the elements. Weather and humidity are the number one enemy of outdoor recycling bins. Resistance and waterproofness are therefore their primary qualities. 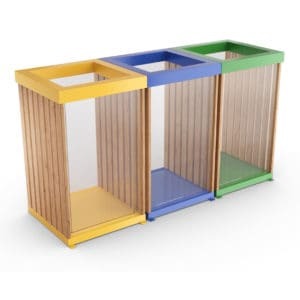 Our Kuokio model is one of these models adapted for outdoor use. It will blend perfectly into any environment; from an airport parking lot to a shopping mall, to hospital grounds. Some of our security recycling bins have been specially designed to prevent the spread of garbage odors. Discover for example our Auriga model. Equipped with traps, it makes it possible to make the waste storage hermetic and thus to isolate the trash as well as its odors from the outside. Have you ever heard of a smart trash can? As pioneers in this field, we offer security containers with sensors for remote management. Thanks to tracking software, you can observe their filling rate as well as their geo-location. This optimizes your waste management, as well as the organization of collection and your maintenance team. 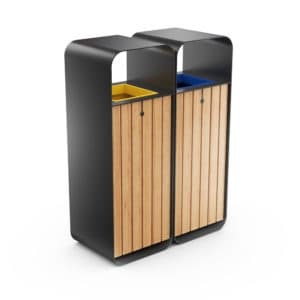 Urbaniere, therefore, offers smart recycling bins that meet the various safety standards, such as the Auriga bin. 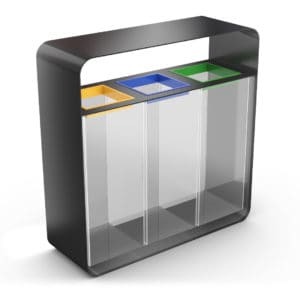 This transparent sorting bin is available with or without traps. Thanks to its sensory captors, you will be able to control its filling level remotely. And once filled, the bin will send you an automatic alert employing a user-friendly interface. With symbols, adapted logos, colors, and dimensions, Urbaniere creates unique and custommade trash cans to offer you a solution that will meet all your needs but also suit your environment and your budget. 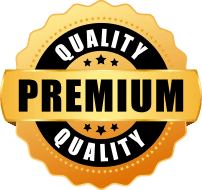 Feel free to contact us for professional advice or to find out more about our security trash cans for recycling.